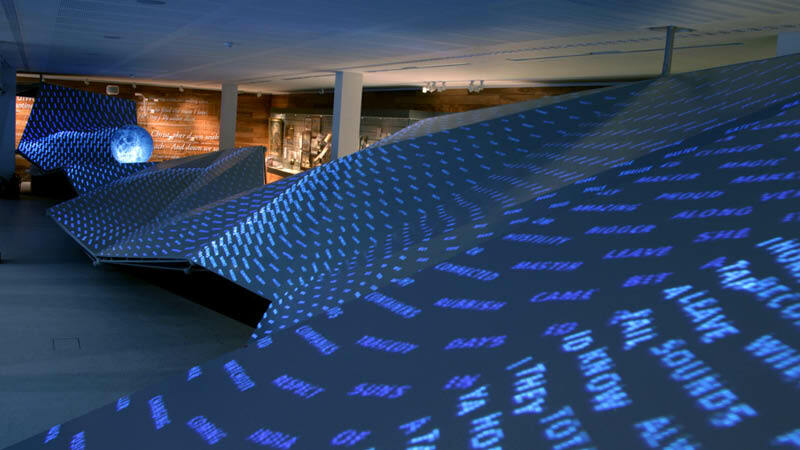 “Voyagers” is a permanent audio video installation by The Light Surgeons for the National Maritime Museum’s new Sammy Ofer Wing. 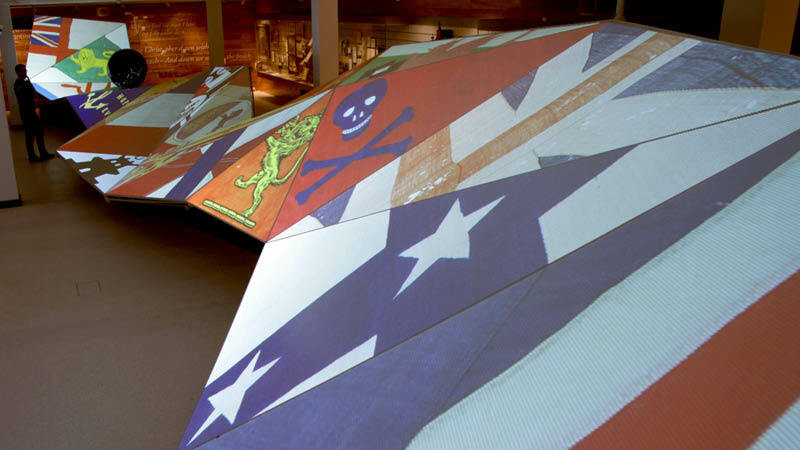 The Voyagers Gallery acts as an introduction to the extraordinary depth and range of the Museum’s collections and is dominated by a 20 metre wave-like structure that stretches the full length of the room. 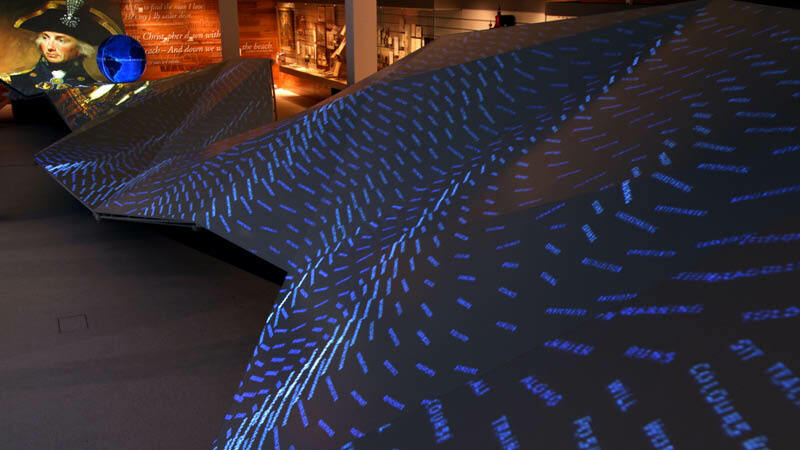 Designed by exhibition designers Real Studio, this 3D wave is made up of 26 triangular facets and features a Pufferfish spherical projector at one end. 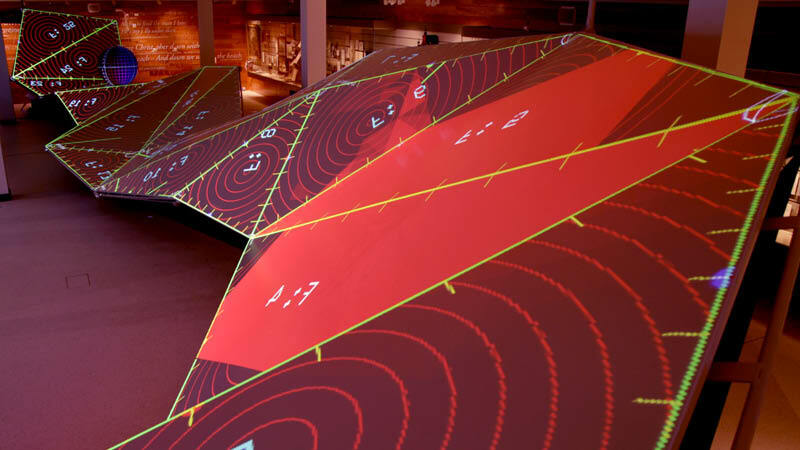 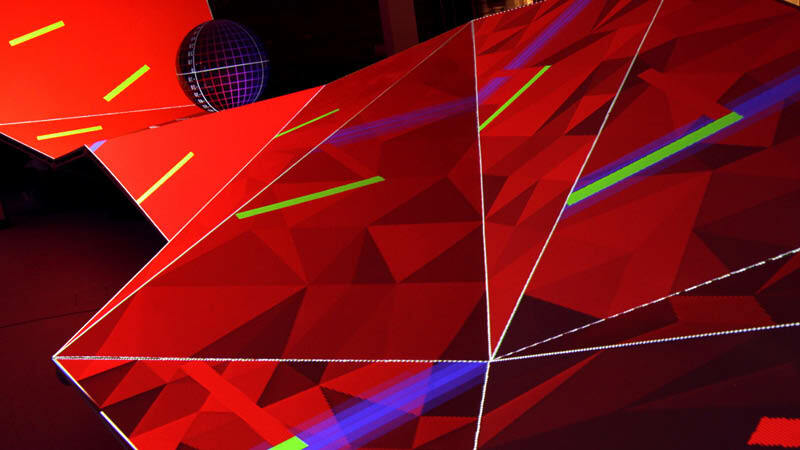 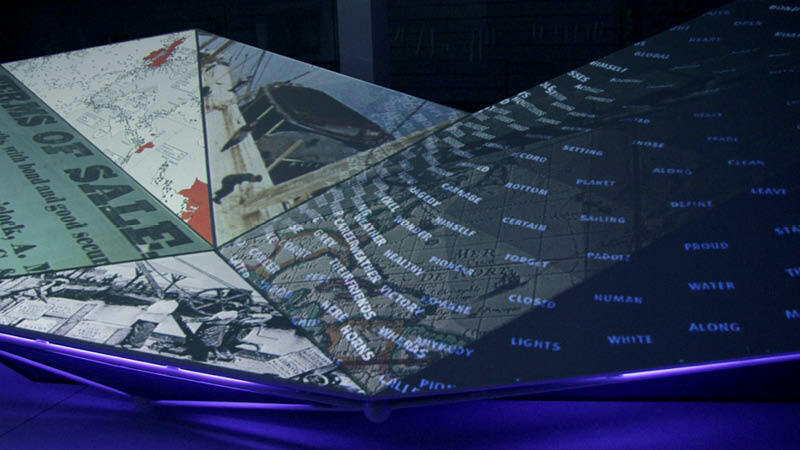 Using the triangular shape as a design template The Light Surgeons researched and meta tagged over 300 images and films from the Museum’s vast archives and translated them into a series of thematic visual journeys that unfold down the wave. 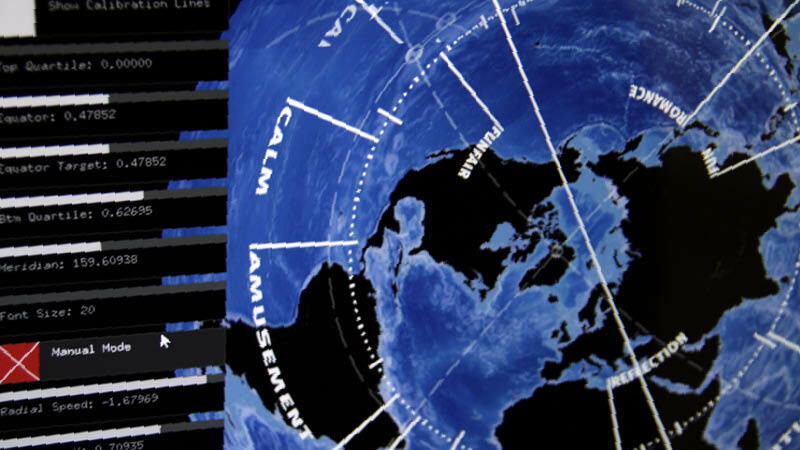 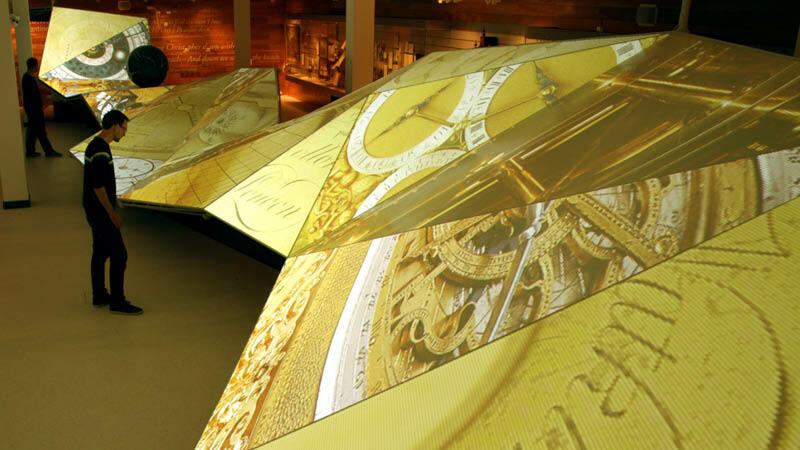 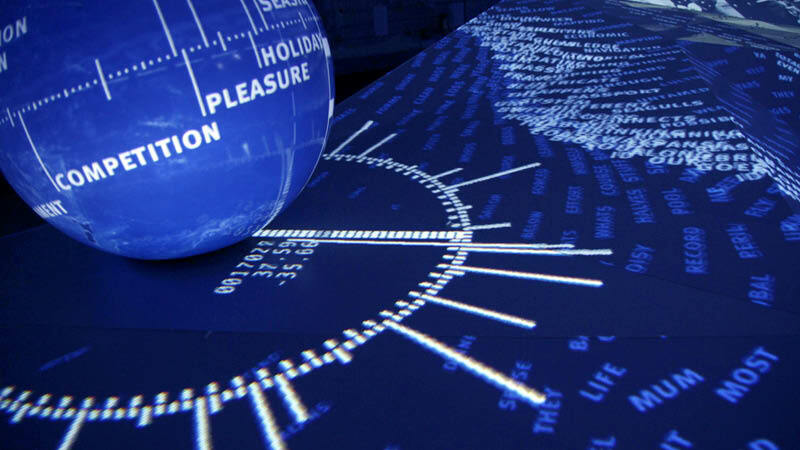 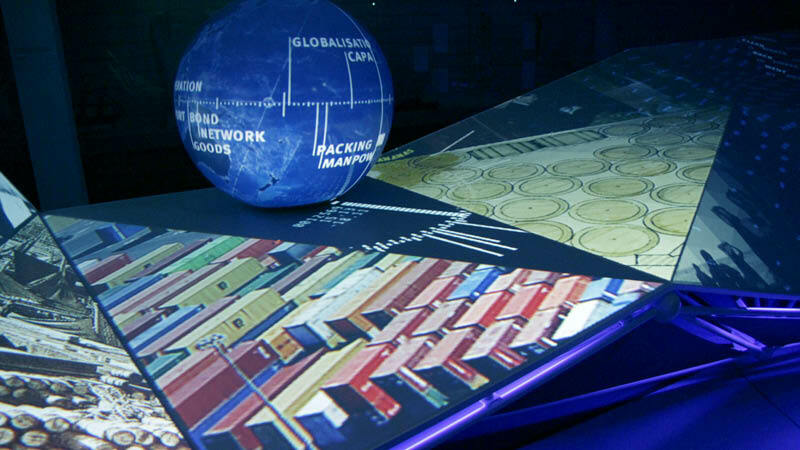 As these designs cascade down the room, the globe projection displays thematic key words relating to each asset in the journey onto a digital navigational device inspired by the museums collection of armillary spheres. 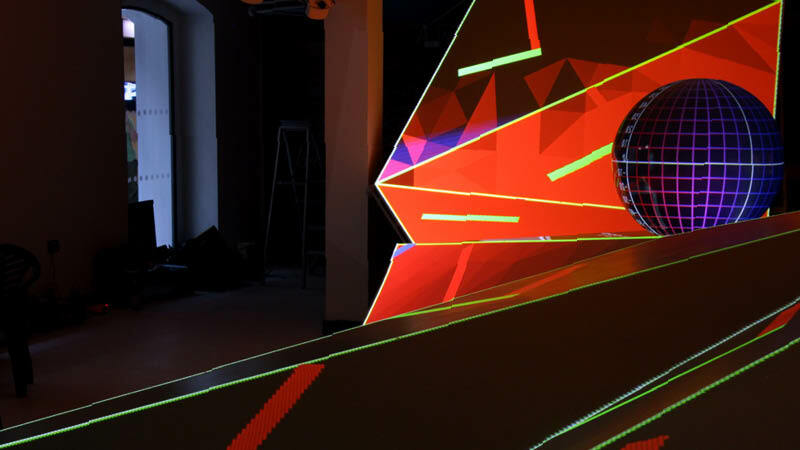 For this technically complex project The Light Surgeons collaborated with media artist James George from New York studio Flightphase to translate their concepts into code based design. 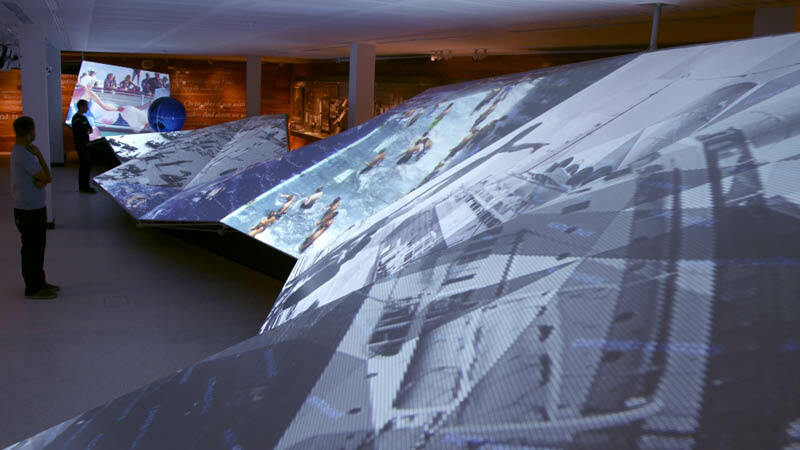 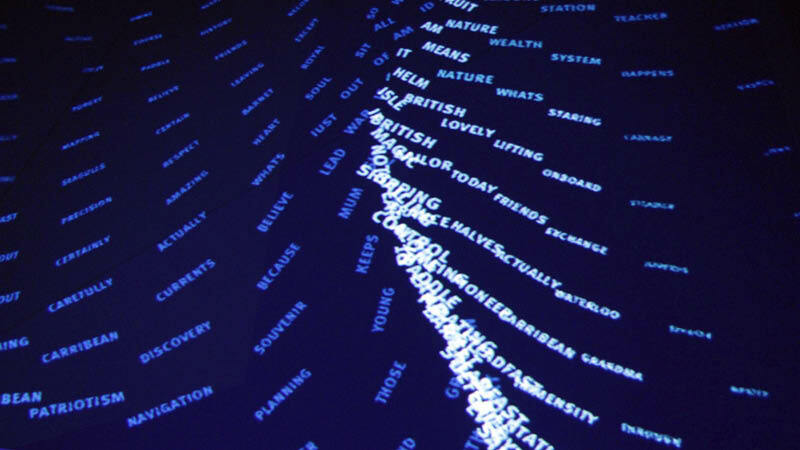 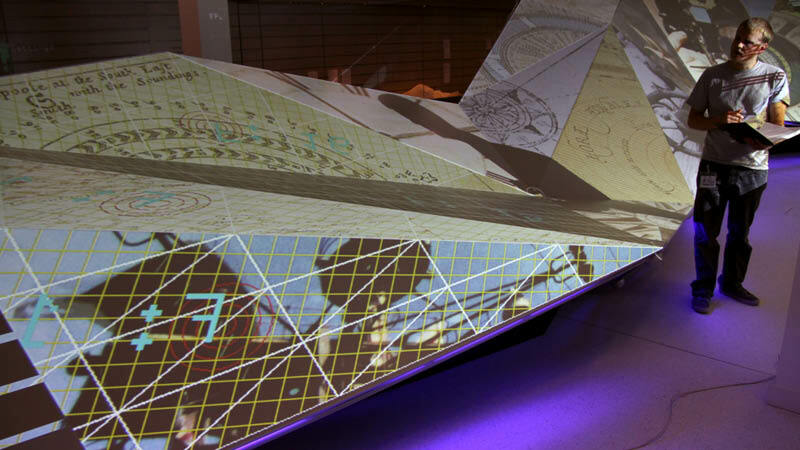 The resulting bespoke software was built using open source coding platform openFrameworks and lead to many new ground breaking developments; allowing the design of the installation to be explored in a simulated environment before the gallery was built and then to seamlessly video map the complex geometry of the wave structure upon its arrival. 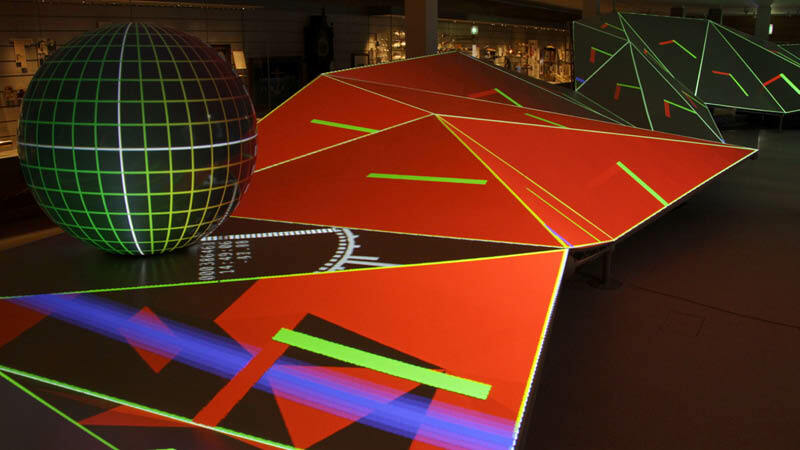 This collaboration also lead to many exciting developments in the creative process including the creation of a totally generative sea of typography and its interaction with the movement of the spherical Puffersphere design. 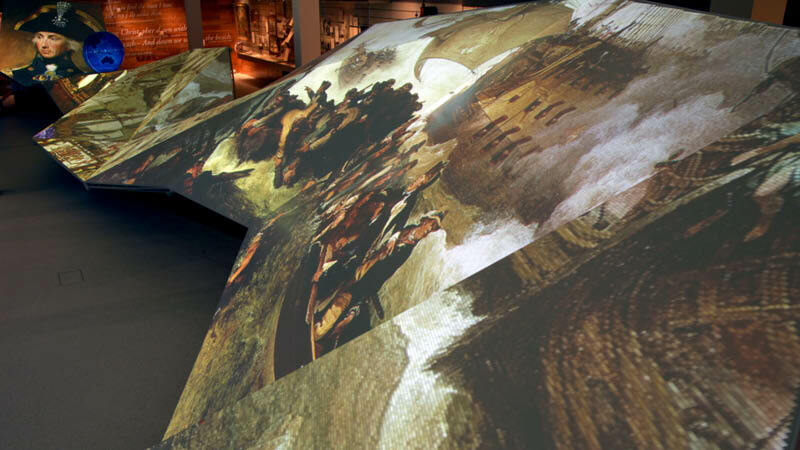 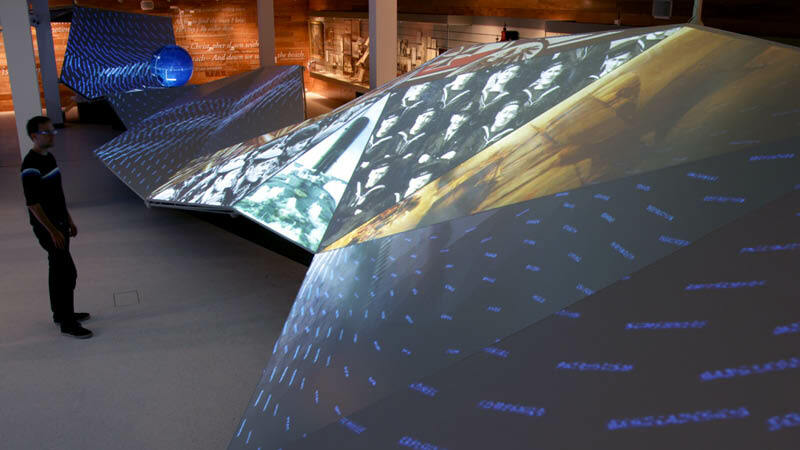 The resulting experience is a truly immersive one that takes its audience on an audio visual journey through a multitude of different themes explored by the museums collections. 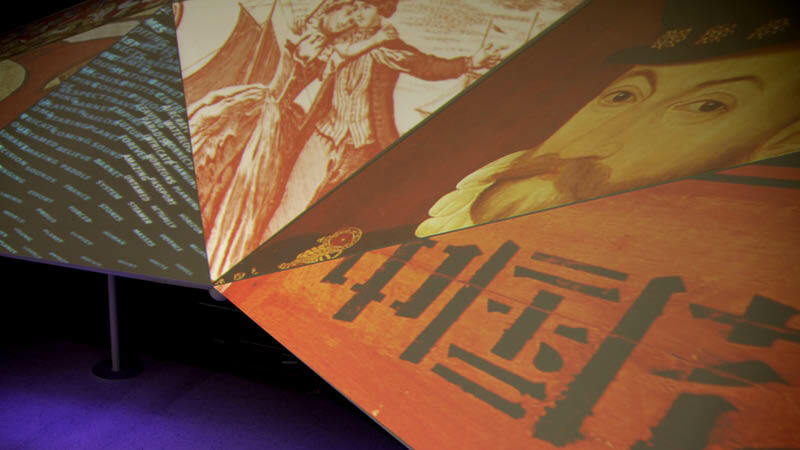 A detailed case study on the design and development of the software by Flightphase for this project can be found here.